To make it to the Champions League final, the Reds needed analytics and shrewd coaching. Oh, they also got really lucky. Roberto Firmino (left) and Mohamed Salah were key finds for Liverpool. The Champions League final seems immune to upsets. Real Madrid won three of the last five finals, with Bayern Munich and Barcelona taking the other two. And now Madrid is one win away from its fourth title in six years and third in a row. But this list of winners should not obscure that smaller clubs have come close. Atletico Madrid has taken Real Madrid to extra time twice in the last five finals, and Borussia Dortmund lost a nail-biter of a final 2-1 to Bayern. This year, it is Liverpool that has a real shot at upending a traditional power structure in the Champions League. And according to FiveThirtyEight’s Soccer Power Index, a Liverpool victory would not even be that much of an upset: SPI gives the team a 47 percent chance of lifting the trophy on Saturday. How did Liverpool become a true Champions League contender? To a certain degree, this is unsurprising. For starters, Liverpool is no upstart, at least historically. The club has five European Cups and its revenues are among the highest in European soccer.1 But the Reds have played in the Champions League only four times in the last decade, and this season is the first time they have even reached the knockout stages since 2009. It took an extensive and highly successful rebuilding effort to get Liverpool to the cusp of a European trophy. The three key components of this effort were smart analytics, innovative tactics and the usual helping of good luck. The engine of this Liverpool team is its front line. Manager Jurgen Klopp prefers a 4-3-3 formation with four defenders, three central midfielders, and a forward line with a central striker flanked by two wide attackers. Center forward Roberto Firmino and left forward Sadio Mane combined for 44 goals and 22 assists between the Premier League and the Champions League, while Mohamed Salah matched that production almost by himself with 42 goals and 14 assists. Every one of these players was acquired in the transfer market: Firmino in 2015, Mane in 2016 and Salah last summer. Hitting on star attackers in three consecutive transfers is a major accomplishment no matter what your budget, but it’s especially impressive for Liverpool, which cannot afford to pay as much as the world’s richest clubs — as was made evident when Philippe Coutinho forced his way out of Liverpool for Barcelona in January. To build one of the world’s most dangerous front lines, Liverpool had to look for relative bargains, which more or less ruled out peak-age players at the height of their powers. Further, with Klopp’s pressing style, the team had to avoid the typical lumbering center forward and look for players versatile enough to press high and interchange in the attack. They needed attackers who could play anywhere in the front line. To find these key pieces, the team turned to analytics. 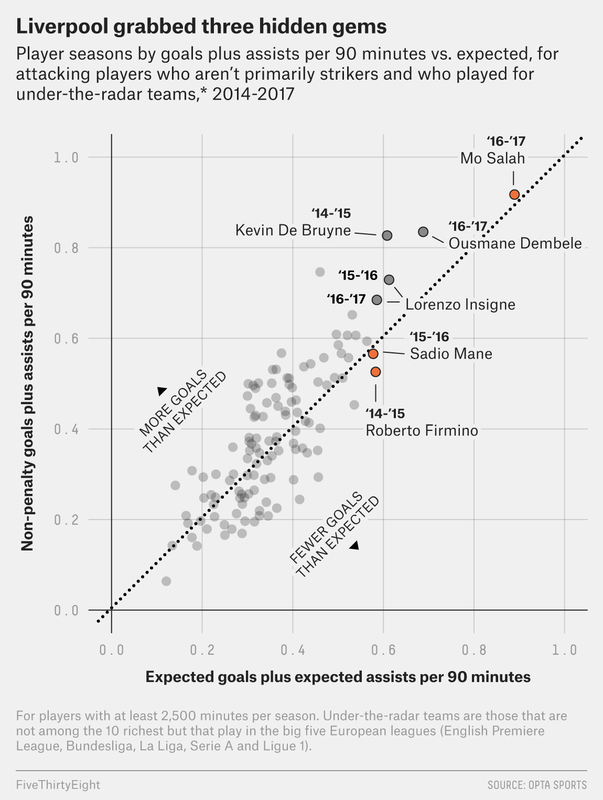 One of the simplest ways to identify undervalued attackers is with expected goals (xG) and expected assists (xA) — two metrics that estimate the quality of scoring chances, built from information collected by sports-data company Opta.2 The ability to get on the end of good scoring chances, or to create them with a telling pass, is more stable across seasons than the ability to finish off such a chance. Over the last three years, very few young players have put up big numbers in xG and xA per 90 minutes while playing on smaller clubs and getting the majority of their minutes from outside the center forward role. Liverpool found three of them. The Egyptian-born Salah was coming off a 15-goal campaign with Roma in Serie A, but the signs of even bigger breakout were there. Liverpool inked him for around $47 million in June of last year, which was then a club record, and 42 goals later, that deal is looking like an incredible bargain. Firmino and Mane both similarly showed their potential before their Liverpool signings: Firmino’s production for Hoffenheim in 2014-15 and Mane’s for Southampton in 2015-16 were among the best player seasons in the sample I examined, which included non-striker attacking players in the five biggest leagues over the previous three seasons.3 Liverpool used data to identify players who weren’t just on a hot streak but who demonstrated repeatable skills, and those purchases have paid off in goals. This season, Klopp has drilled his team to drop the pressing intensity in matches where it’s not needed. While they still can press high, Liverpool can also sit back and absorb pressure, as they did to great effect in the Champions League quarterfinal against Manchester City. This improved tactical flexibility has yielded results — reducing opponents’ goals, chances and successful fast attacking moves by a significant margin. 2015-16 only includes games when Klopp was manager. It is practically impossible to win a cup final without some good fortune. Liverpool, by using its resources smartly and developing more flexible tactics, put itself in position to take advantage of good fortune when it arrived. And this year, every time the UEFA drew teams into competitive fixtures, Liverpool benefited. In the round of 16, Liverpool got to face Porto and avoid a match against Real Madrid or Juventus. This increased the Reds’ chance of winning the Champions League from about three percent to about five percent. For the quarterfinals, Liverpool got a tough matchup in Manchester City, but most of the other remaining teams were also extremely strong, so the draw caused only marginal movement in Liverpool’s chances of winning the Champions League. Then the semifinal draw brought the greatest bounty, as the Reds avoided Bayern Munich and Real Madrid to face Roma instead. This increased Liverpool’s chance of winning the league from about 20 percent6 to 29 percent. As the table of team luck shows, Real Madrid has reached the Champions League final by facing a true gantlet. They got Paris Saint-Germain in the round of 16, Juventus in the quarters and Bayern Munich in the semifinals. However, the draw is not the only method by which good fortune may affect the outcome. Real would not have made the finals if Bayern Munich had not been extremely profligate with its chances. Bayern scored only three goals, but based on the chances the team got, we would expect them to have gotten 6.9 goals. But the way Bayern got all those chances bodes well for Liverpool. They pressed high and created turnovers. If Liverpool can execute its pressing game as effectively as Bayern did, the Reds should also be able to make trouble for Real Madrid. In this game, Liverpool’s defensive flexibility probably will be less help — sitting back and allowing Cristiano Ronaldo time to find space in the penalty area does not seem like the best option. With heavy metal soccer, Klopp may finally win a Champions League and bring a trophy back to Liverpool. CORRECTION (May 24, 2018, 6:15 p.m.): A previous version of this article incorrectly described Real Madrid’s path to the Champions League finals this year. They played Bayern Munich in the semifinals. Ninth highest last season, according to Deloitte. The model for calculating expected goals seeks to give a single estimate for the likelihood of scoring a given shot, and the estimates for each shot are then added up over a season to give an expected goals total. You can find further methodological details in previous writeups. Minimum 2,500 minutes played combined between the player’s domestic league and the Champions League and European League. Direct attacks are calculated as attacking moves in which at least 50 percent of the movement is directly toward the goal, meaning that if you draw a straight line from where the attack started to where it ended and then measure the total distance the ball covered over all the passes and runs in the move, the ratio between those two distances must be at least 0.5. The exact number was not available, so I extrapolated from the last number available before that draw.